Krissy Dodge feeding the dolphins at SeaWorld San Antonio. Over the past year I’ve had some fascinating and revealing conversations with three dedicated former SeaWorld Animal Care workers: Jim Horton, Cynthia Payne and Krissy Dodge. Their experiences have given me a much deeper understanding of the lives of the animals at marine parks (and the lives of the employees! ), and last month I published some of what they had to say over on Outside Online. Today, The Dodo is publishing another installment of my conversations with Jim, Cynthia and Krissy. 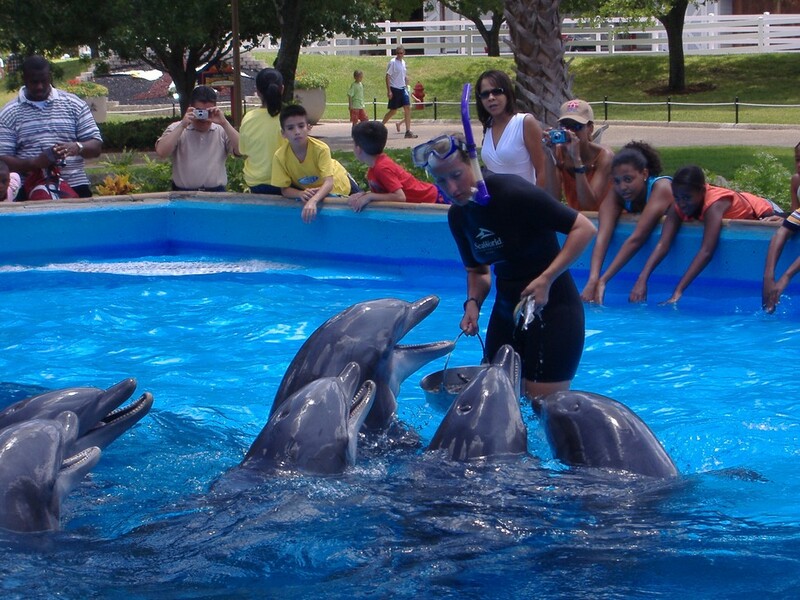 It focuses on the dolphin feeding pools, a steady and important source of revenue at SeaWorld. This installment will be followed by another either later this week, or early next week. Occasionally we’d have to get a young calf whose Mom was still in the pool. Mom would do anything trying to get the calf away from us. I broke my nose once on [the vet’s] head. I had the calf. He was trying to stop the female from getting to me, and she whacked him. And he went flying and his head went right into my face and knocked me practically unconscious. We did not mess with calves until they were one year old. But when we did at that age of one year and up, the little ones really put up a good fight as this was something new. So that generally took two to three guys. But then the mothers would come after us in attempts to dislodge the calf. A coordinated effort was required to grab both mother and calf at the same time and hold them very close together, face to face. We would handle only one animal at a time, unless it was a mom and calf. So it was always a battle in that pool and those animals weren’t really trained to do much. Read the whole thing here. You will learn lots of new things about dolphin feeding pools. I promise.